Some chemical engineering professionals share there insights on the opportunities available for those that specialise in the profession. These are excerpts of the insights as shared by the US chemical engineers on AIChe website. Responses varied considerably, but certain themes did seem to recur. A ChE degree is still a great degree and allows for employment in a diverse range of fields and professions. Chem E grads continue to be well recognized over other engineering fields as excellent candidates for positions throughout manufacturing operations that are non-engineering and non-technical. Chemical engineers are increasingly finding work in allied fields, rather than in traditional chemical engineering fields. I do a considerable amount of mechanical engineering and have for awhile, because I work for an electric utility. I also do a considerable amount of chemical engineering, specifically water purification. I think integrating skills from several fields is increasingly necessary. 2016 was a tough year for the oil and gas market, and it did seem to affect the jobs in the area. Current employer was under a hiring freeze. Companies are very cost conscious and will likely hire young to offset cost of aging workforce. Please inform the youth of the opportunity cost (e.g., work-life balance, sanity, etc.) versus success of gaining employment. Employment demand appears to be strong overall, though the specifics are changing. For example, if you change jobs you may have to change industries or geographic location to find a new position quickly or without pay reduction. A lot of EPC work is now being moved out of the US to low cost centers, such as India. The advent of cloud computing and new software technology allows much more outsourcing than was possible even a couple of years ago. Wages are depressed and many US chemical engineers have been layed off while the largest EPC companies are expanding abroad. A photo of the TEM JEOL 2010 microscope in the University of Bristol. 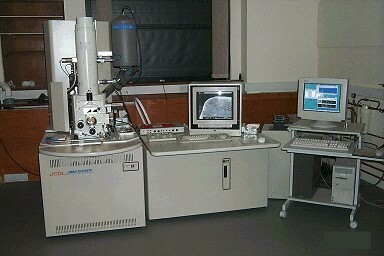 Transmission Electron Microscopy is one of most powerful techniques in materials science, which is widely used in the characterization of adsorbent. It has ability to examine the constitutional characteristics of the adsorbent such as shape and size, crystallinity and chemical variations at a resolution down to the nanometer scale. With advanced design, modern TEM enables lattice defects, atoms and even their movements to be seen. The analysis capacity of TEM has been significantly enhanced by integration of several advanced techniques into the instrument. These techniques include spectrometers, such as energy-dispersive X-ray analysis (EDX) and electron energy loss spectroscopy (EELS). To examine materials by TEM requires a sample that normally should be less than 3 mm in diameter with the area of interest sufficiently thin to allow electrons to penetrate it. 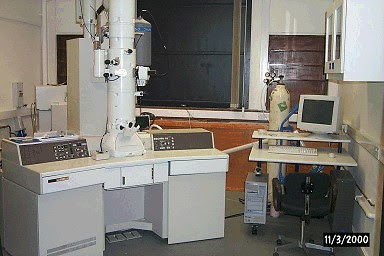 A photo of FESEM JEOL 6300 FEG microscope in University of Bristol. In adsorbent study, SEM is a tool that is commonly used to analyse adsorbents’ morphology. If compared to TEM techniques, SEM has less resolution. However, SEM has good enough resolution for analysing adsorbents (up to 0.1 µm) and provides three-dimensional images. 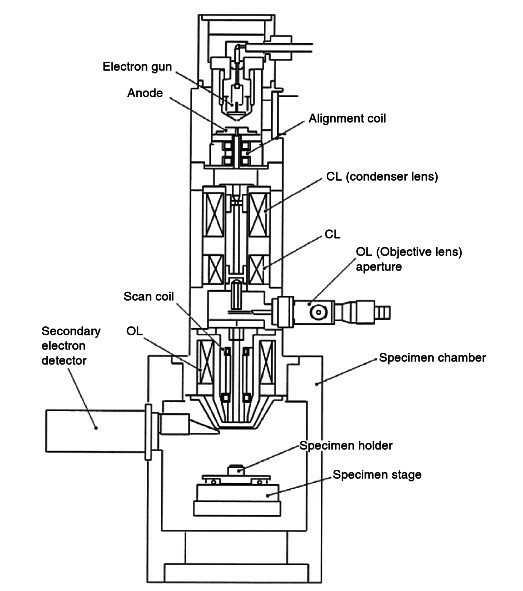 The operating principle of a scanning electron microscope is similar to TEM, the main differences lay in how electron beams are used to hit the sample and how reflected particles are converted into images. SEM operation is based on a high-energy beam of electrons ranging from 5-50 kV that impact a solid bulk, i.e. the sample. 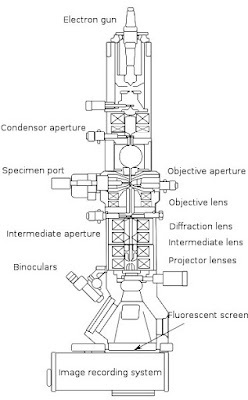 The beam runs through lenses system where it is condensed (focused); according to the principles of electronic microscopy, the smaller the beam the better resolution because the energy is concentrated in a smaller surface. Also, a coil arrangement magnetically deflect the incident beam, responsible for scanning the electrons on the specimen, line by line and point by point. In this case, the electrons that are not absorbed by the sample, but are bounced in different directions and with different characteristics as such backscattered electrons and X-rays, Auger electrons, secondary electrons among others. The image of the sample is usually generated by secondary and backscattered electrons, meanwhile, the X-rays are used for elemental identification. These bounced particles, produce different type of signals due to their different nature and properties like density and chemical identity. Finally, signals are collected, amplified and transformed into visual images on a cathode ray tube, similar to that of televisions. The requirement for samples being analyzed under electron microscopes, is that they can conduct electricity, for non-conductive materials, they are usually coated with thin films of conductive metals such as gold. The figure below shows principal constituents of SE microscope. 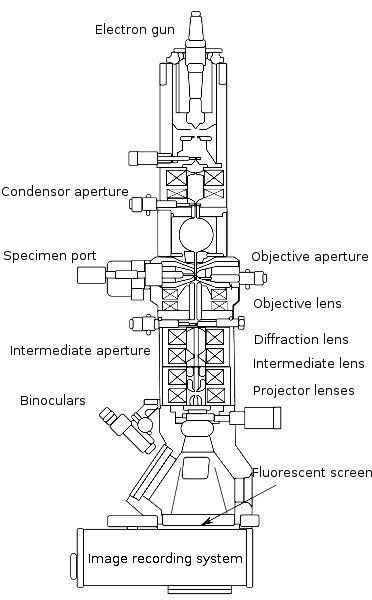 In summary, an SEM consists of three distinct parts: an electron column; a detection system; and a viewing system. Two electron beams are controlled simultaneously by the same scan generator: one is the incident electron beam; the other is for the cathode ray tube (CRT) screen. 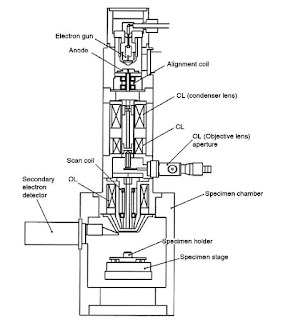 The incident beam is scanned across the sample, line by line, and the signal from the resulting secondary electrons is collected, detected, amplified and used to control the intensity of the second electron beam. Thus a map of intensity of secondary electron emission from the scanned area of the sample will be shown on the CRT screen as variations in brightness, reflecting the surface morphologies of the specimen. Given this mechanism, the magnification of the SEM image can be adjusted simply by changing the dimensions of the area scanned on the sample surface. 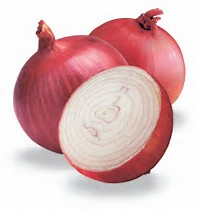 In this research, the organic conditions for boosting the flavonoids and antioxidant of onions was unveiled. Five years ago, a highly publicized meta-analysis of more than 200 studies concluded that organic food was no more nutritious than conventionally grown food. Since then, however, additional work has suggested the organic foods contain more health-benefiting phytochemicals. Now, researchers have found that flavonoid levels and antioxidant activity in organic onions are higher than in conventional onions. Their investigation, in ACS’ Journal of Agricultural and Food Chemistry, is the longest-running study to address the issue. Hydrogen fuel is the lightest and simplest fuel with zero emission on combustion. It is used as a fuel in vehicles. One of the biggest hurdles to the widespread use of hydrogen fuel is making hydrogen efficiently and cleanly. Now researchers report in the journal ACS Nano a new way to do just that. They incorporated a photocatalyst in a moisture-absorbing, semiconducting paint that can produce hydrogen from water in the air when exposed to sunlight. The development could enable hydrogen fuel production in almost any location.Traditionally, hydrogen destined for industrial use has come from fossil fuels. But this approach creates carbon byproducts and other pollutants. In search of a cleaner source, researchers have turned to water as a source of hydrogen. Current methods to split water focus on its liquid form and thus require liquid electrolytes, which lead to high cost, inefficiency and other technical challenges. These drawbacks could be overcome by using water in its gas phase, but few studies have explored this strategy. So Torben Daeneke, Kourosh Kalantar-zadeh and colleagues set out to fill this void. Fourier Transform Infrared spectroscopy (FTIR) is a technique based on the vibrations of the atoms within a molecule. It becomes prominent at the beginning of 20th century and then developed due to the rapid development of technologies on computer and Fourier transform. It has many advantages such as short time of measurement, high sensitivity and resolution and broad range of measurement spectrum. 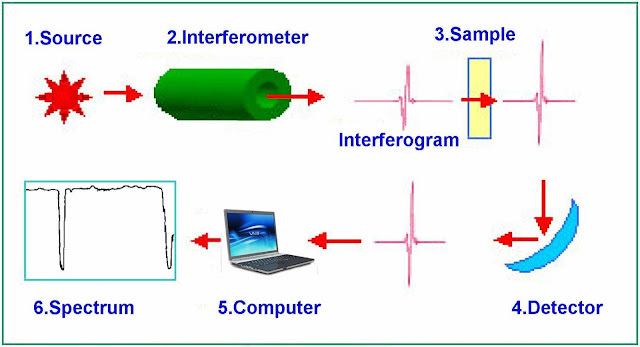 An infrared (IR) spectrum, from which the details of the functional groups present on the adsorbent can be determined, is obtained by passing IR radiation through a sample and determining what fraction of the incident radiation is absorbed at a particular energy. The energy at which any peak in an absorption spectrum appears corresponds to the frequency of a vibration of a part of a sample molecule. Moreover, chemical bonds in different environments will absorb varying intensities and at varying frequencies. The FTIR sample handling is to grind the adsorbent finely with a specially purified salt (usually potassium bromide) to remove scattering effects from large crystals. This powder mixture is then crushed in a mechanical die press to form a translucent pellet through which the beam of the spectrometer can pass. Therefore IR spectroscopy involves collecting absorption information and analyzing it in the form of a spectrum. Since each interatomic bond may vibrate in several different motions (stretching or bending), individual bonds may absorb at more than one IR frequency. Stretching absorptions usually produce stronger peaks than bending, however the weaker bending absorptions can be useful in differentiating similar types of bonds (e.g. aromatic substitution). The basic components of an FTIR spectrometer are shown schematically in the figure below. The radiation emerging from the source is passed to the sample through an interferometer before reaching a detector. Amplification of the signal converts the data to a digital form by an analog-to-digital converter and then transferred to the computer for Fourier transformation to be carried out. One of the great advantages of infrared spectroscopy is that virtually any sample in nearly any state can be studied. 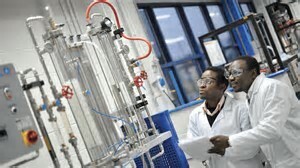 Liquids, solutions, pastes, powders, films, fibres, gases and surfaces can all be examined by a judicious choice of sampling technique. FTIR spectroscopy is carried out to study the potential existence of C-N, C=C and C≡N bonds among others in the adsorbent. The deputy national president of the Nigerian Society of Chemical Engineers (NSChE), Engr. Onuchie Anyaoku; while speaking after the monthly meeting of the Federal Capital Territory (FCT) and Nasarawa chapter of the NSChE, which was also used to inspect WEAMS factory owned by a fellow of the society, Engr. Wereuche Morgan Amadi; called on the Federal Government to be more careful on its plan to build modular refineries to avoid the challenges facing the existing ones. Engr. 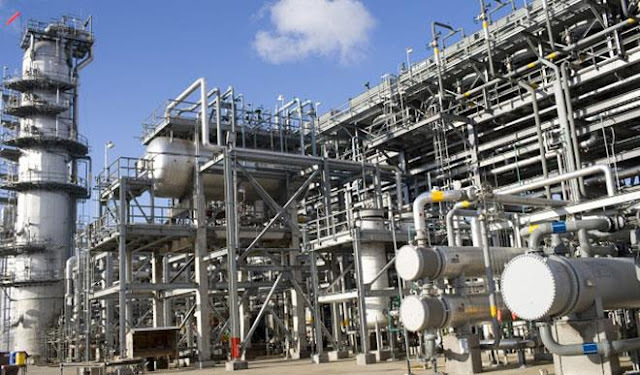 Anyaoku, who said the modular refineries were not in any sense different from big world-scale standard refineries apart from its small size, stated that the skills, the expertise and the knowledge required to build, manage and maintain modular refineries were exactly the same in big refineries. He said, “The environmental and safety challenges faced in big refineries are also faced in modular refineries. So, the society is not against modular construction, especially if it is done in the country, and if it is modularised such that we can export the jobs outside the country, the society is not against it. “But if it is modularised to be fabricated and constructed in the country and it meets the business need of the promoters without direct cash injection from government, the society is not for it. Last Friday in Abuja, the society presented a position paper to Acting President Yemi Osinbajo on modular refineries, which the government intends to adopt as a policy. Engr. Anyaoku, who decried the near absence of job opportunities for young chemical engineers, said no country could develop without industrialisation, science and engineering. He said the meeting with the acting president was used to submit a letter of request to the Presidency for the society to be considered for inclusion and participation in the various committees and agencies of government set up to drive the energy sector growth, Nigeria’s industrial revolution, the national economic and growth master plan and the Nigeria sugar development master plan. Highlight of the occasion was the presentation by Engineer Chinweze Michael on the hydro-carbon processing software used in the oil and gas industry, one of the core mandates of the WEAMS factory. Being that adsorption capacity of adsorbents depends on surface area, pore structure and surface groups, polarity, solubility and molecule size of adsorbates; solution pH and the presence of other ions in solution; they need to be characterized by various analysis techniques so as to investigate and obtain information pertaining their physical structures and chemical properties. It was also argued that application of solid adsorbents requires their characterisation which comprises the determination of their chemical composition, crystallographic and geometrical structure, surface and mechanical properties, and the energy distribution functions as well as the shape and size distribution of the pores within the materials so as to know their energetic heterogeneity and physical nature. When associated with additional independent measurements; such as calorimetric, spectroscopic and other ones; it gives valuable details on the correlation between the energy distribution of adsorption sites and their chemical nature. Also, the main purpose of characterization of adsorbents is to establish relationships between their properties and applications. It should be emphasized that not all the techniques are suitable for all adsorbents. While characterizing adsorbent, it is important to identify what specific characteristic is intended to study in order to choose the most appropriate techniques. Thus surface area and pore structure can be determined by applying FTIR, X-Ray Diffraction (XRD), N2 physiosorption (BET), Scanning Electron Microscopy (SEM) and Transmission Electron Microscopy (TEM), electroanalytical techniques and many others to accomplish the mission. What you need to know about LASER. You may be wondering on how can there be a narrow light travelling a long distance without being dispersed, making use of light in surgery 'Laser Surgery'. Here is an article that will light-up your way in getting to know more about Laser light. 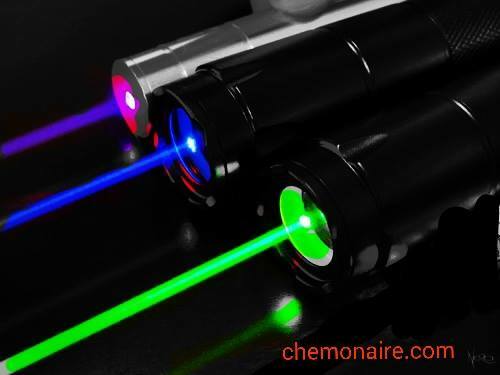 LASER is an acronym formed from "Light Amplification by Stimulated Emission of Radiation. Laser is a device that emits photon of light through a stimulated emission of radiation. The essential feature of laser action is positive-feedback I.e the more photons in a given frequency the more photons of that frequency will be stimulated to form . This type of light a very wide applications. Lasers can be used in optical disk drives, barcode scanners; DNA sequencing instruments, laser surgery and skin treatments; cutting and welding materials, laser lights displayed in entertainments among others. For laser action to be achieved, there has to be an existing metastable excited state, this is an excited state with an enough long lifetime for its participation in stimulated emission. 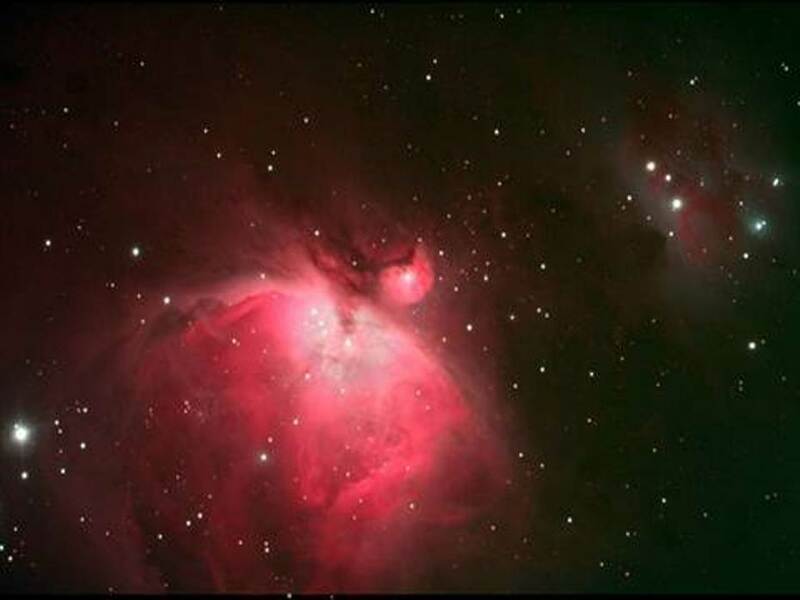 Also another requirement is the existence of greater population in the metastable state than in the lower state where the transition terminates, for then there will be a net emission of radiation. In a nutshell, Lasers are sources of high intensity monochromatic radiation that can be applied in different fields for different purposes. Researchers in Spain have developed photocatalytic process that offers a greener way to produce organic alcohols and other important compounds used to manufacture pharmaceuticals and pesticides. The new technique, developed by Julio Lloret-Fillol’s team at the Institute of Chemical Research of Catalonia (ICIQ), is air tolerant, works in water, and doesn’t use the rare-earth metals often called upon to catalyse such reactions. Instead, it reduces aldehydes and ketones using a system that combines cobalt and copper. A cobalt complex plays an essential role in promoting the reaction, while a copper co-catalyst significantly increases the system’s activity. Visible light activates the process at temperatures as low as 15°C. The procedure’s tolerance to air is unusual, as oxygen normally deactivates catalysts based on earth-abundant elements. The team demonstrated the reaction with more than 20 aryl ketone substrates, as well as a selection of both aromatic and aliphatic aldehydes. And although they tested the catalytic system in water, it showed a selectivity in favour of reducing the organic substrates over the water molecules of more than 2000:1. Surprisingly, the technique also preferentially reduces acetophenone over highly reactive aliphatic aldehydes when applied to mixtures of substrates. In this discovery it has been unleashed that Earth abundant materials can be nano-engineered to make best use of increasingly abundant solar power. The sun ultimately provides the energy for almost every living organism on Earth, and could supply all of humanity’s renewable energy needs. But storing and transporting this energy is hard. Now researchers in Switzerland have developed a catalyst, made entirely from earth abundant materials, that allows solar-generated electricity to reduce the environmental pollutant carbon dioxide to the valuable chemical feedstock carbon monoxide. One possible way to close the anthropogenic carbon cycle would be to use renewable electricity to reduce carbon dioxide – such as that produced by fossil-fuelled power stations – to liquid fuels or the ingredients needed to make them. Carbon monoxide, combined with hydrogen, can produce liquid hydrocarbons via the Fischer–Tropsch process. Copper oxide is moderately effective at electrochemically reducing carbon dioxide, producing a mixture of carbon monoxide, hydrogen, formic acid and up to 15 minor products. However, Jingshan Luo of the Swiss Federal Institute of Technology in Lausanne says: ‘It’s very challenging to separate so many products.’ More selective catalysts have usually relied on precious metals such as silver, gold or palladium. In the new research, Luo and colleagues used atomic layer deposition – a modified form of chemical vapour deposition allowing deposition of single, continuous atomic layers – to cover copper oxide nanowires with a very thin layer of tin oxide. This helps the nanowires to catalyse the reduction of carbon dioxide to carbon monoxide, while inhibiting any further reduction. When uncoated copper oxide nanowires were used as a carbon dioxide reducing catalyst, their selectivity for carbon monoxide peaked at 36%. However, the selectivity of the tin oxide-coated nanowires peaked at 97% and remained high across a broad range of electric potentials – important for a viable industrial solar-to-fuels setup as variable light levels would lead to variable solar cell voltages. The material can catalyse not only the reduction of carbon dioxide at the cathode, but also oxygen evolution at the anode. However, it catalyses carbon dioxide reduction best at near-neutral pH, but needs alkaline conditions to catalyse oxygen evolution. The researchers created a two-compartment cell, with the cathode compartment at pH 6.75 and the anode compartment at pH 13. 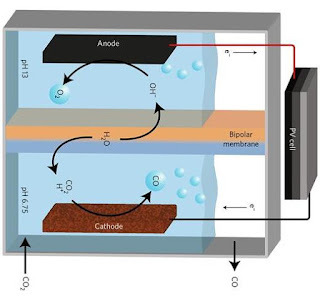 If the two compartments were completely separate, proton consumption would increase the pH of the cathode compartment, while hydroxide consumption would reduce the pH of the anode compartment. The researchers therefore placed a bipolar membrane, comprising a cation-exchange membrane and an anion-exchange membrane, between the two compartments – a technique recently pioneered by Smith’s Delft University group and others. ‘Because of the potential across this membrane, water molecules dissociate inside the membrane into protons and hydroxide ions,’ explains Luo. ‘The protons go through the cation exchange membrane into the cathode compartment, and the hydroxide ions go through the anion-exchange membrane into the anode compartment. Thus the overall pH difference of the compartments can be maintained.’ The researchers connected the cell to a triple-junction photovoltaic cell of their own design, allowing the carbon dioxide reduction process to be driven by solar-intensity light. They are now working to increase the catalyst’s efficiency and thereby reduce the over-potential (the voltage experimentally required above that thermodynamically necessary), in the hope of allowing cheaper double perovskite cells to drive the reaction. 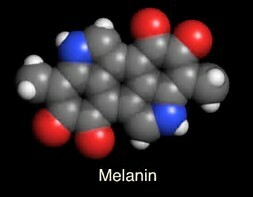 Scientists have long known that colour pigment -melanin has numerous useful qualities, including providing protection from cancer-causing UV radiation and free radicals, but also electronic conductance, adhesiveness and the capacity to store energy. To take advantage of these qualities, scientists across the City University of New York (CUNY) have developed a new approach for producing materials that not only mimic the properties of melanin, but also provide unprecedented control over expressing specific properties of the biopolymer, according to a paper published in the journal Science. The discovery could enable the development of cosmetic and biomedical products. "We took advantage of simple versions of proteins -- tripeptides, consisting of just three amino acids -- to produce a range of molecular architectures with precisely controlled levels of order and disorder," said lead researcher Rein V. Ulijn, director of the Nanoscience Initiative at the Advanced Science Research Center (ASRC) at the Graduate Center, CUNY. "We were amazed to see that, upon oxidation of these peptide structures, polymeric pigments with a range of colors -- from light beige to deep brown- were formed." Adsorption is a process in which a substance (adsorbate), in gas or liquid phase, accumulates on a solid surface. It is a simple and low cost system for the extraction of heavy metals and other charged particles from solution. In a more chemical language, it is the extraction of matter from one phase and concentrating/accumulating it on the surface of a second phase. It is also referred to as interface accumulation. An adsorbent is a solid material on whose surface adsorbate molecules accumulate during the process of adsorption. Adsorption of the adsorbate on the adsorbent is governed by physical and chemical interactions between the adsorbate and the adsorbent surface which depend on the characteristics (surface area, pore size distribution, and surface chemistry) of the adsorbent, and the characteristics (molecular weight and size, functional groups, polarity, solubility) of the adsorbate, and the physical and chemical properties of the solution (pH, temperature, presence of competitive solutes, ionic strength). Adsorption of an adsorbate to the surface of an adsorbent is governed by bonding forces resulting from electromagnetic interactions of the adsorbate atoms, molecules and ions, and the adsorbent surface. The most important physical properties of adsorbent, which determines its usage, as the pore structure and the specific surface area. The total number of pores, their shape and size determine the adsorption capacity and even the dynamic adsorption rate of the adsorbent. The total surface area of adsorbent quantifies adsorption sites for molecules to attach. The micropores usually provide the largest proportion of the internal surface of the adsorbent and contribute to most of the total pore volume. Mesopores, macropores and the nonporous surface of sample represent the external surface. Despite most of the adsorption takes place in the micropores, the meso- and macropores serve as passage for the adsorbate to reach micropores. Moreover, the multilayer adsorption only takes place in meso- and macropores. 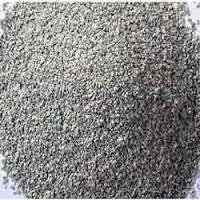 Adsorbents are classified into two types i.e. natural materials and synthetic ones. Natural adsorbents, are usually non-conventional low cost adsorbents used for removal of compounds but their adsorption capacity is relatively low. 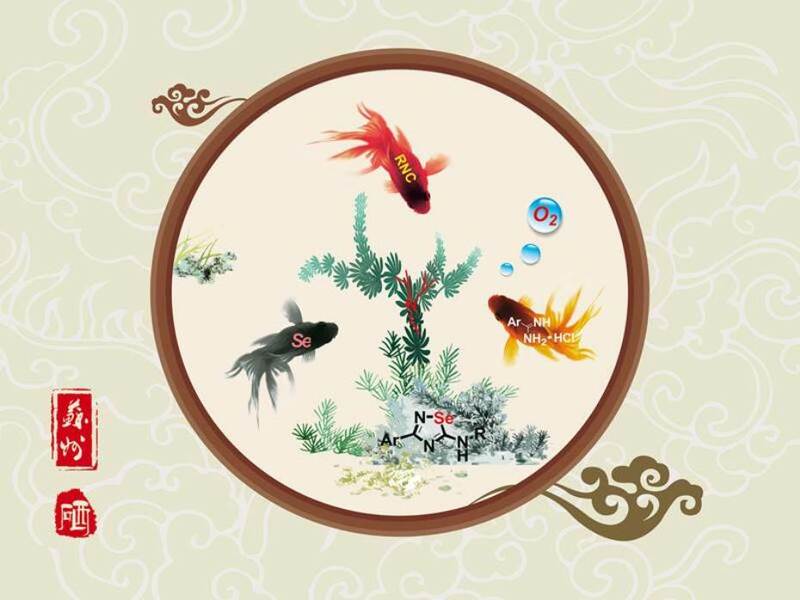 They include peat/sphagnum moss peat), red mud, coir pith, leaves, activated sludge, waste organic peel, tree fern, lignite, sawdust, banana pith, peanut hull, modified chitosan beads, natural biopolymers, biosorption materials, and minerals such as activated ash/clay. On the other hand, there are many types of synthetic or artificial adsorbents (convential adsorbents) such as adsorbent (AC), resin, adsorbent, and so on used in adsorption operation. They are widely used adsorbents for removal of inorganic and organic compounds because they have excellent capacities for adsorption of compounds derived from their huge surface area, developed pore texture, as well as easy availability. The American Institute of Chemical Engineers also talked on the US plan to stay out of the Paris Climate Agreement. According to AIChE,, its member engineers and their companies have supported US participation in the Paris Agreement, from which the US is now withdrawing. The agreement is an internationally negotiated plan for mitigation, adaptation, and finance of greenhouse-gas emissions that is intended to start formally in the year 2020. AIChE’s existing climate-change policy reflects the assertion that its members are especially well suited to shape and inform technical and societal decisions about climate-change mitigation and adaptation, including those that support past US commitments pursuant to the Paris Agreement. This statement remains true whether or not the US remains a party to the Agreement. Accordingly, in March AIChE and its Public Affairs & Information Committee (PAIC) started a targeted communication plan to engage members regarding climate change and to assist in reviewing AIChE’s climate-change policy. 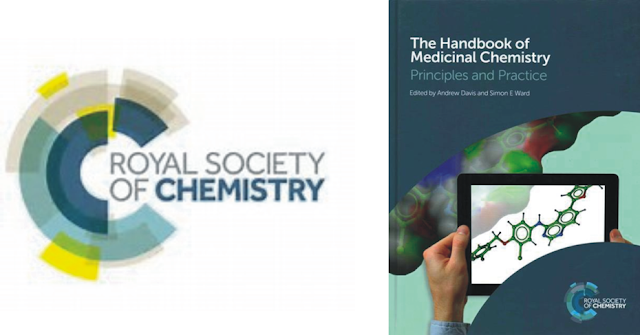 The RSC Medicinal Chemistry Residential School is the longest running and most highly valued short course for medicinal chemists in the world. For over 33 years, it has been a starting point for thousands of medicinal chemists, including some of our industry’s leading lights. The course is designed to ease their transition from an often pure synthetic chemistry training into fully fledged medicinal chemists, who can integrate information from biology, drug metabolism, toxicology and pharmaceutical properties into design hypotheses that can lead to candidate drugs. The first course was held in 1981, and designed by Robin Ganellin and Anthony Roe. It was designed by industry, for industry, and its successful format of introductory talks, hands-on practical workshops and case studies has remained unchanged over the years. But while the course stays true to its roots and its structure remains unchanged, the content has certainly moved with the times. It is now unthinkable that toxicology was not part of the course until about 10 years ago. Likewise, important themes such as target validation and pharmaceutical development were not covered until recently. Meanwhile new themes, such as fragment-based drug discovery and structure-based drug design, while once novel features of case studies, are now covered as a core part of the curriculum. One of the highlights of the course has always been the workshops, run by tutors who are all expert practitioners in their respective fields. The workshops are intensive, interactive and fun, and cover aspects of drug design including optimising a lead, physical property-based drug design, drug metabolism, pharmacokinetics, and computational methods. Fundamental science lectures run throughout the week and provide support for the workshops. Over the years discussions and graph paper exercises have evolved into hands-on experience with advanced software tools and real-life data. The most popular workshop however still uses semi-log graph paper – in the 1980s it was cutting edge, but nowadays it is often the delegates’ first (and last) experience of it. Towards the end of the week the delegates have the opportunity to practise everything they’ve learned with a real-world scenario. It is now usual practice in the pharmaceutical industry for one company to design and test a new drug, before ‘out-licensing’ it to another company who takes the drug to a global market, and the activity is designed to replicate this scenario as realistically as possible. In teams of five the delegates play the role of the global company – they receive a ‘pitch’ from the out-licensing company, and then have the rest of the day to evaluate the package and decide whether to in-licence the new product or not. The activity finishes with a presentation, and teams are rewarded for the quality of their assessment and presentation, teamwork, and creativity. This is the kind of activity they may face in their day jobs, and the first edition of the workshop was a great success. It will return in 2017 where it is likely to cement its place as a permanent fixture of the course. Other highlights include the case studies, which enable the delegates to see the principles they have learned applied in real-life projects at a mature stage of development. Some of the industry’s blockbuster drug stories were first heard on this course while still in development. The heart and soul of the course are its dedicated tutors. Many of them were once attendees and have now come back to pass on their experience to the next generation of medicinal chemists. For example previous attendee Simon Ward is now Professor of Drug Discovery at University of Sussex and runs the lead optimisation workshop and associated lectures. Andrew Thomas, now global head of Medicinal Chemistry at Roche, has given some of our most interesting recent case studies, and enthusiastically joined the 2015 Due Diligence workshop in-licencing 'board'. Bob Ings and Colin Vose, who run the Metabolism and Pharmacokinetics lectures and workshop, have been tutoring on the course since the late 1980s, and maintain the course’s supply of semi-logarithmic graph paper. Andy Davis never 'escaped'. He attended as a delegate in 1991, and returned as tutor in 1993 and eventually became scientific lead. In 2017 Simon Ward will pick up the baton as scientific lead. The study of adsorption of various substances onto adsorbents has been explored by many researchers, ranging from the adsorption of heavy metals, dyes and colourants to other chemicals that are involved in various processes. Adsorption of materials (adsorbates) from gas or aqueous phase onto solid surface is a classic field of interest to chemists. This arises due to two main reasons. The first is the environmental impact of some of the adsorbates –as such they need to be removed from the environment (effluents) to avoid contamination and intoxication; while the second reason is for isolation. The solid surfaces on which the adsorption takes place have some characteristics that make them capable of holding the adsorbate. This include their surface area and morphology, pore structure, pore size distribution, pore volume, pH, elemental composition, functional groups, surface charge, crystal structure and, of course, thermal stability. The possible adsorption capacity of various adsorbents can be predicted by evaluating the above properties. This can be achieved by characterizing the adsorbents using the methods of characterization available. Generally, this work study the methods of characterization of adsorbents which include FTIR, electron microscopic techniques, X-ray techniques, thermogravimetric analysis and differential scanning calorimetry, BET surface area, Boehm titration and potentiometric titration.